Those who know my story will already know that adoption is very close to my heart because my youngest son is adopted. In fact, the story of how he came to us is nothing short of miraculous. When I auditioned to be on The Biggest Loser I had many motivating factors. But one of the things that drove me the hardest was my desire to have another baby. We had been trying naturally for years and were faced with the diagnosis of infertility. Doctors told me that my polycystic ovaries (PCOS)—which is the number one cause of infertility in women—contributed to my inability to conceive. PCOS also carries with it many devastating characteristics; among them excessive weight gain. I figured if I got my weight under control, my PCOS would likewise be under control and I could conceive another baby at the end of my Biggest Loser experience. I remember many grueling workouts when I would tell Jillian Michaels about wanting a baby so badly—as I worked hard towards building a healthy body that could carry one. At the end of the process I believed my condition was under control. My insulin resistance (which is also a part of PCOS) was under control and I was off all medication used to treat the condition. I was a healthy body weight and ready to try to have a baby again. That’s when my husband delivered the shocking news that he believed we were supposed to adopt instead. We had never discussed adoption, nor are there any cases of adoption in either of our families. But he felt strongly that God was leading us in this direction. He had felt this way for many months while I was away working towards my personal goal. I conceded to at least submit our family profile for consideration not thinking there was much of a chance. There were too many obstacles to overcome. It was too much of a long shot. Well, God’s ways are not our own. And they are always better than what we could think up ourselves. About two weeks after submitting our profile and meeting with the social worker to inquire about going through the adoption process, we were bringing our baby boy home from the hospital. My sweet, precious Jaxon. Clearly God's proof that His ways are best! We met his birth mother and have communicated with her many times over the past three years. She gave us a precious gift through her sacrifice. We truly believe God intended for Jaxon to be our child, and she was the wonderful vessel who carried him for us. He has brought such joy and laughter into our family. We can’t imagine life without him! I share this story with you for several reasons. First of all, because it seems appropriate as we celebrate National Adoption Month. Secondly, I never get tired of telling it because it is evidence of God’s working in our lives. Only He can truly give us the desires of our hearts when we seek Him (Psalm 37:4) and give us exceedingly abundantly above what we could ever think to hope or ask for (Ephesians 3:20). I also wanted to share this story as a confirmation that we don’t always know what the future holds and our best laid plans aren’t always what are best for us. At the time I was disappointed to have lost The Biggest Loser by such a small margin. And yet, had I won I wouldn’t have been able to receive what I truly wanted from the beginning. I was first runner up to Bill Germanakos and during the time that I was nurturing and loving being a mom to my new baby he was traveling the country under contractual obligations with NBC and was on the road more than he was home. That schedule and a newborn would never have worked. In retrospect it all worked out exactly as it was supposed to. I realize that God doesn’t always choose to work things out in such a dramatic a way. And even when we experience His will, it’s not always a guarantee of such a happy ending. But you can always trust that He has our very best interest at heart. So when things aren’t going quite as you planned…maybe you need to just hang in there a little longer and you too will experience something far better than you could have ever planned for yourself. A recent online blog for Marie Claire magazine has caused quite a stir. So it’s an edgy, contemporary women’s magazine; what else is new, right? Well, there was something about this particular article that rubbed me especially the wrong way—and not just for superficial reasons. The topic was—to put it delicately—the subject of overweight people on television expressing physical affection. Nothing x-rated. Just the same, normal interaction you’d see on any primetime sitcom. 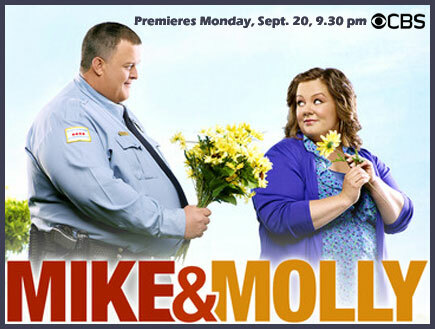 The show being discussed in particular was Mike & Molly — a new show whose principle characters are an overweight couple. Well, as a woman who has been medically classified as “morbidly obese” I can’t tell you how distressing this article was to me. It was obviously written in ignorance. But prejudice against the obese is the last remaining “acceptable” prejudice in America, it seems. An article about any other specified segment of society (be it race, gender, religion, etc.) wouldn’t be acceptable. My close friend Hollie (who starred on the Biggest Loser 4 with me) spearheaded a discussion on Facebook about this article. The responses from people were most disturbing. It simply reinforced the devastation that obesity inflicts on lives. The article didn’t serve as any motivation to lose weight. It just made those who have that struggle feel worse, more condemned and less worthy. I have written before about the impact that words can have on a person’s spirit. They can breathe life or death. Since the upheaval that was prompted by this blog, its author has issued an apology. But to some degree, the damage is done in the psyches of the people who read it and internalized it. I am bringing further attention to it—not to amplify the negativity, but rather to reinforce the fact that we must find value both in ourselves and in others, NOT in the physical attributes we possess but in the value instilled in us by God. Believe me, I am an advocate for weight loss, exercise and healthy living! I think it’s the only way to live! But I also know that there are many things that cause people to be overweight and it’s not always a simple fix. Don’t buy into the comments promoted by articles like the one I mention here. Let’s face it—an overweight couple kissing on TV is a lot closer depiction of reality than two picture-perfect actors doing the same kind of smooching. But instead, be encouraged that change is possible. You don’t have to be satisfied with carrying the extra weight—not for vanity’s sake, but for the quality of your own life. So stop kissing your husband and get off the couch and go for a walk! Although I would never encourage anyone to be content with a life sentence of morbid obesity—you must remember this: if you never lost one more pound or one more inch God wouldn’t love you any less. And for me, just knowing our Creator loves me that much gave me even more incentive to make a change. And you can too!